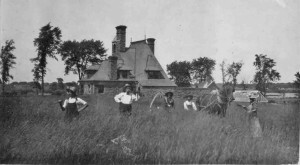 In 1900 the Clarkson family, which had contributed to its founding, initiated a major building program at Bayside. 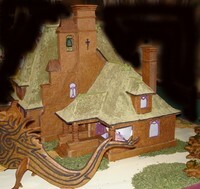 They hired Edgar Josselyn, a well-known New York architect, to design the gatehouse, or lodge. Josselyn had previously designed Old Main, Clarkson University's first and foremost building. The photo at the top right of this page is the gatehouse as an award-winning entry in the county's annual gingerbread house contest. 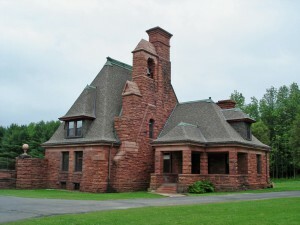 The lodge, build in the fashionable chateau style of hard red sandstone from the Clarkson quarries, provided a residence for the sexton as well as facilities for funeral services. 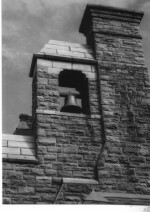 A bell was mounted in the tower in honor of Levinus Clarkson, and rung at funerals and during visiting hours. The masonry style is irregular ashlar, each rough-faced block having straight sides and laid in non-coursed patterns. Some elements such as the lintels over the windows have been cut smooth. Dagger-like metal crosses are pinned to the chimney. In the photo above the porch at right covers the entrance to the viewing room. The bell is in the tower with the opening. A dagger-like cross is visible on the chimney. The photo below enlarges those features. This historic photo below shows men haying with horses before the entryway's landscaping was finished. The monumental features at Bayside's entryway are meant to establish a strong boundary between the bustling outside world and the quiet contemplative world within the burial grounds. Sophisticated stone-cutting machinery was used to carve the urns and other decorative elements. 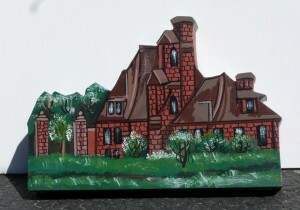 This painted wooden miniature of the gatehouse was created for the St. Lawrence County Historical Association (www.slcha.org) and can be purchased from them. 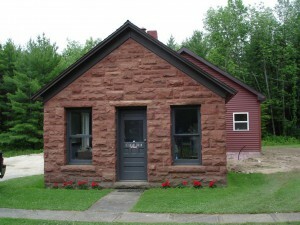 The sexton's office was also built in 1900. It too is made of hard red sandstone in rough ashlar style. It still serves its original purpose. Until 1980 the cemetery also maintained a greenhouse behind the sexton's office for funeral and tomb flowers. 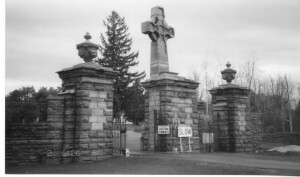 The cemetery maintains a mausoleum near the entrance to the burial grounds for temporary housing of caskets, such as during deep winter when the ground is frozen. 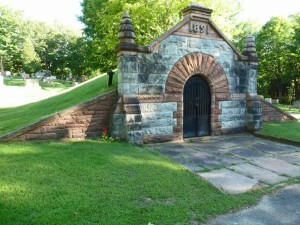 The mausoleum was built in 1891 of Potsdam red sandstone with grey "Gouverneur marble" (limestone) decorative elements.